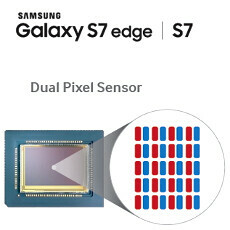 We couldn't help but wonder why did Samsung move from the already blazing fast phase-detection autofocus (PDAF) to an obscure Dual Pixel technology on the newly-announced Galaxy S7 and S7 edge. Not only is the 12 MP camera sensor a radical departure from the megapixel rat race we've seen on flagship phones for a few years now, but the whole camera module is brand new, with 56% bigger individual pixels, compared to he S6, and this Dual Pixel focusing for the first time in a phone. So, what exactly will this new focusing tech bring that PDAF couldn't? Phase detection is better than the widespread contrast detection as it only has to take one measurement from opposite sides of the lens to figure out where to, and how far a lens has to be moved to achieve focus, for instance, making the whole focusing process quicker. 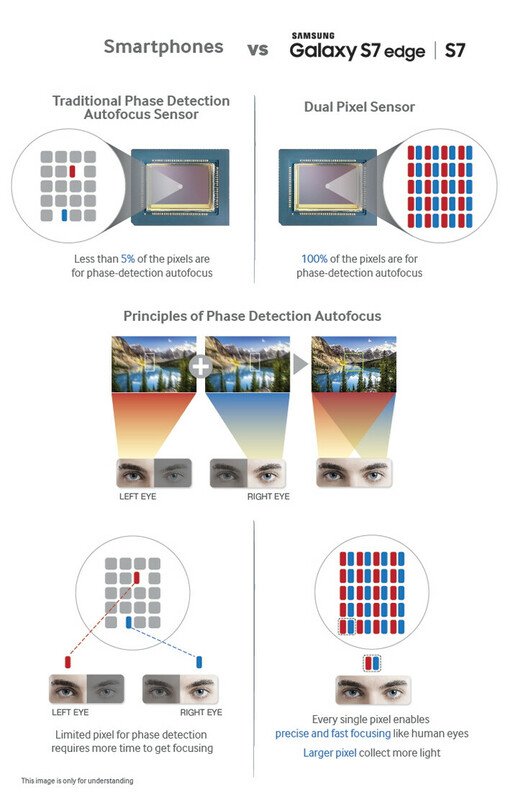 PDAF does that by having up to 10% of the total number of pixels equipped with "focusing" photodiodes (Apple even calls them Focus Pixels), and dispersing them strategically throughout the sensor area. How about multiplying even that speed, and adding more accuracy to the mix, too? This is what the Dual Pixel sensor on the Galaxy S7 and S7 edge is trying to achieve, as it employs two photodiodes for every single pixel, so instead of 5-10% of the pixels being used for focusing, a 100% of them will now. The implications for focusing speed and accuracy are huge, especially with moving objects, live footage, or in low-light scenarios, and we can't wait to grab a bite, and clash Samsung's new Dual Pixel AF system with Sony's fresh Predictive Hybrid Autofocus on the new Xperia X-series. I want better lowlight detail, not night vision (though pretty damn cool). Faster focusing will help in lowlight as well. Need more control over the camera. I will forever love Google for auto translate. That aside, that is a noticeable difference. I don't think the gap will be quite as significant once everything is finalized and the Phones go on sale, but the s7 photos look better hands down. Nice S7 camera takes nice photo especially after changed the ratio to 4:3 instated of 16:9. But I noticed some pinkish especially at hand photo doesn't look natural like G5 photo?!. No need for that gimmicks. Why not Xenon flash and optical zoom. Yeah we get it, everything samsung makes are gimmicks. From what I can see from a few videos about it and having owned the S6 edge, the S7 seems to be nearly instantaneous. I wouldn't venture to say it is twice as fast as the S6, but it's close to that. What a waste of R&D. Auto focus was already fast enough. They could have fit a bigger or better sensor than the abomination that's in the s7. Well it looked quite a bit faster then auto focus in the presentation at least. I think you're being a bit too harsh on Samsung just because they didn't put the rumored sensor size but that's how rumors are. Lets wait and see how it actually turns out in a review from independent reviewers. So far its looking good to me and a significant improvement over S6 which was pretty good to begin with. I think there might be a good enough reason why Samsung didn't put the rumored sensor as its unlike Samsung to not include the absolute latest and greatest in their flagship. It's not about rumors. It's about them putting lower sensor size than 6 month old phones. On most phones, auto-focus takes much less than 0.5 seconds. Making that 0.1 or even 0 won't make that much of a difference. hmmm.....that's fair but we both are shooting in the dark when we say why Samsung hasn't included the bigger sensor. It could very be Samsung trying to cut cost or any other technical reason but like I said its unlike Samsung. Anyway, noob here but could the bigger aperture size have affected the sensor size. I don't think so. Let's wait and see how the camera turns out. My guess is that it will be better than competition, but not by much. That's where I have issues as this phone can get destroyed later this year by new nexus/iPhone. Looking at the iPhone's camera of the past few generations their improvements have been pretty small. So I am not too hopeful. As for Nexus, even 6P with its 2.3 sensor was only able to perform better then S6 during low light scenarios only and S7 has made quite a significant improvement at least for low light scenarios. So I am not so sure even a sensor size of Nexus would've made a significant difference. You might say its because of Samsung's image processing but as Macready said it might as well be because increase aperture to f1.7. You might be right when you talk about the competition exceeding but I think you're overestimating the competition looking at the history. S7 should beat Nexus 6P easily. The difference in pixel size is not much, Samsung easily makes up for more than that in aperture, lens quality, OIS and much superior software. As I said, the current competition shouldn't be much of a challenge. It's high time for iPhone to improve optics. They are lagging behind too much. And Nexus was good in 2015. So I expect them to up their game this year. I guess you're right. Then again, super large apertures are not very good alternative to large sensors. Large sensors are better at everything(except cost and compactness), while larger aperture can have disadvantages like edge softness and aberrations. Though I'm sure Samsung has taken care of those issues. Let's wait and see. But it sure murders almost all cameras right now. that just gives us wide angle or zoom capabilities. It doesn't improve quality of image. It's kinda like the gimmick of G5. I don't care about wide angle. In low light, it can actually take seconds on most phones. This is where the S7 made leaps. The faster lens helps it gather as much light as some competitors with slightly larger sensors. In that sense, going from f1. 9 to f1. 7 makes a larger difference than going from 1/2.6“ to say 1/2.3". Exactly, issues with focusing speed are why so many low light shots turn out so bad. This won't eliminate the problem but will most definitely help.